Net Entertainment have reached out into the world of branded slots. Branded slots are becoming big business and offer some of the most famous and best loved casino games. This game is no exception. 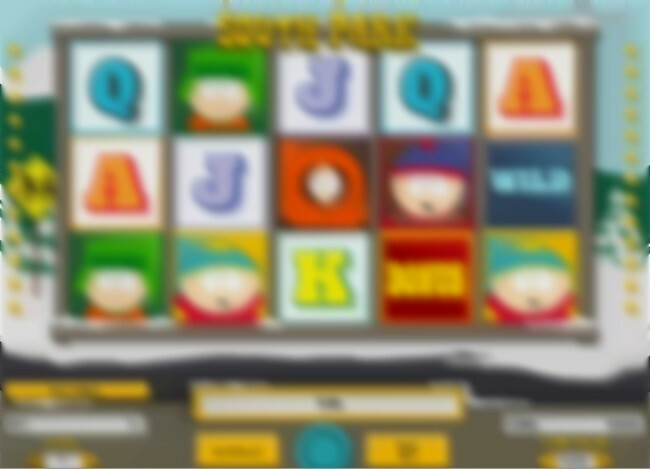 NetEnt have brought the animated world of South Park into the online casino with this fun online slots game. The game has the same animations as you find in the TV show, with original sound and video clips. There are 25 paylines across 5 reels. There is an autoplay feature and you can choose coin size and number of coins to be per payline. There is also a huge jackpot payout of 1,250,000 coins. The game has standard game play however there are some fun animations to keep you amused. Even when you get a low win you will be greeted by one of the characters with a funny one liner and the catch phrases from the show. All the great characters can be seen as you spin the reels, in addition wo wild and scatter symbols there is the bonus symbol, get a bonus symbol on reels 3, 4 and 5 and you will enter a bonu game. There are also some instant random features that are quite fun. The Terrance and Phillip mini feature with give three random adjoining wilds as they fart their way across the reels. The Mr Hankey min feature will also award up to five random wilds and the Cartman mini feature will give block and stacked wilds that are frozen for the next spin. When you get the bonus symbols the bonus symbol on reel 5 will reveal which bonus game you will play. There are four to get, two of which award free spins. Stan Bonus Spins and Kyle Bonus Spins each give 10 free spins with special features such as sticky wilds. The best games are the Kenny Bonus Game and the Cartman Bonus Game which will award cash bonus, multipliers and double ups. Our online casino partners at Casino Euro and BetSafe have given us access to this demo version of the video slot game. Enjoy playing it for fun below. Casino Euro is a truly European casino with offerings in all european langauges and currencies. They offer the best NetEnt games but now also offer the great video slot and scratch games from Microgaming and Playtech aswell.